An exceptionally large bronze model of a carp cast in a natural swimming pose. The front and back bottom fins flare to allow the model to stand. The dorsal fins rise above the back in a lobed line and the scales on the body are carefully delineated. 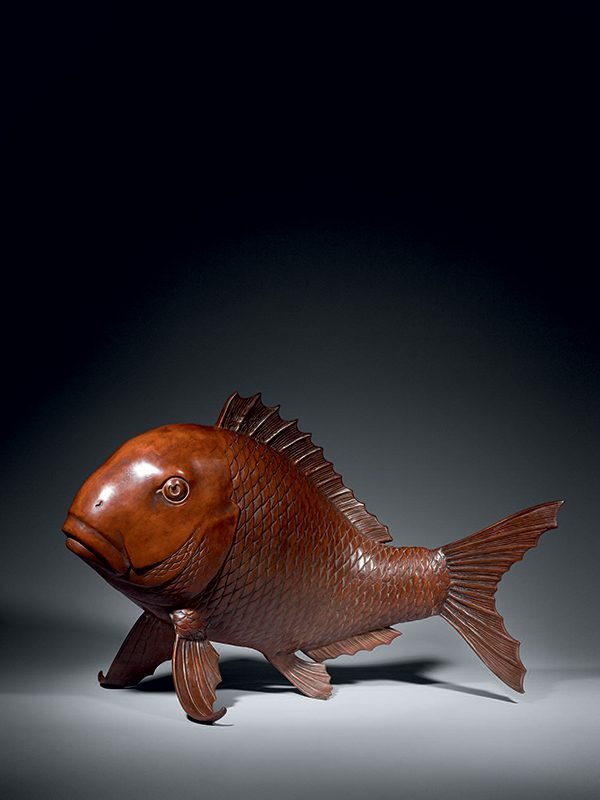 The head of the carp is well detailed with typical bulging eyes, gills and pronounced lips. The bronze has a mellow, chocolate brown patina. In Japanese, the word koi (meaning: carp) is homophonous with the word that means ‘affection’ or ‘love’ and carp are therefore symbols of love and friendship in Japan. We do not know exactly what this wonderfully detailed and life­ like model of a carp was used for originally, but it could possibly have functioned as a shop sign, to indicate the wares for sale.